Does Namco's Klonoa remake manage to capture the magic of the original Playstation release? Before true 3D platformers became all the rage, 2.5D platformers began showing up on Sony's Playstation console during the 32-bit era. These games featured 3D visuals, but kept the player on a 2D pathway through the game. This would allow developers the freedom of using 3D visuals without the hassle of trying to figure out how to set up the play control in a fully 3D environment. 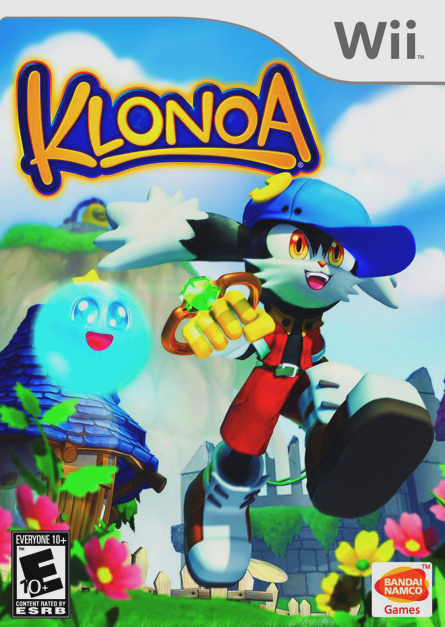 Namco released the original Klonoa on Sony's Playstation console in 1998 and despite being an outstanding title top to bottom, the game went largely ignored and its sales proved fairly dismal. Now here we are a full ten years later and for Klonoa's 10th anniversary Namco has chosen to resurrect the floppy-eared mascot on Nintendo's Wii console. Not only does the game feature a gorgeous visual makeover, it also gains a few Wii motion controls as well. But does this classic 2.5D platformer still have what it takes to compete in a world dominated by flashy 3D platforming titles? Despite the 3D visuals found in Klonoa, the game is still basically played on a rail. While this might sound a bit limiting to gamers who've become used to the freedom of a fully 3D adventure, the game does offer up multiple pathways throughout each level that allow for quite a bit of exploration, especially in later levels. 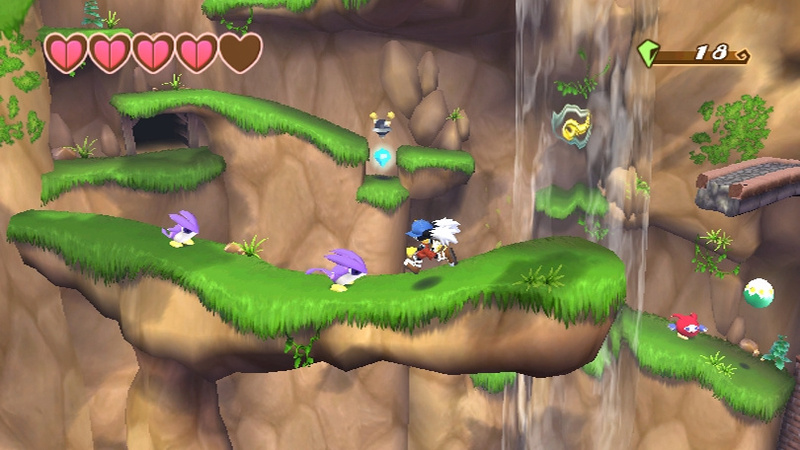 Klonoa has several gameplay moves at his disposal beyond the standard running and jumping moves found in most platformers. Using his Ring, Klonoa can grab onto enemies and carry them, and he can then choose either to toss them or throw them in a downward motion that will provide him a double jump. You can even make Klonoa flap his ears and float in midair for a short amount of time by holding down the jump button while in the air. There are six different areas in Klonoa called Visions, and each Vision is divided into two stages. At the end of the second stage, you'll generally square off with a boss before you can proceed to the next Vision. Along the way, you can rescue villagers that are hidden throughout each level, and also collect Dream Crystals in order to gain extra lives. While platforming plays the biggest role in Klonoa, there’s quite a bit of problem-solving as well: many levels feature tricky puzzles that require you to hit various switches or locate keys to open locked doors. 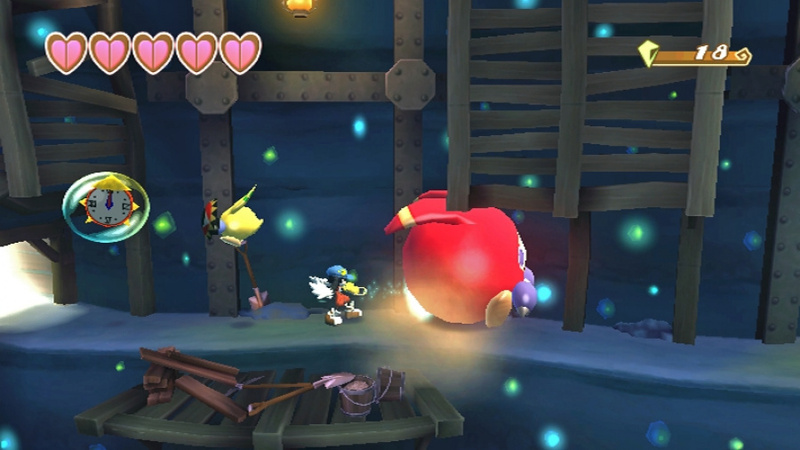 It's this careful blend of platforming and puzzle-type challenges that gives Klonoa its unique appeal. The play control in Klonoa is quite responsive and provides a solid feel for the tricky platforming elements strung throughout the game. 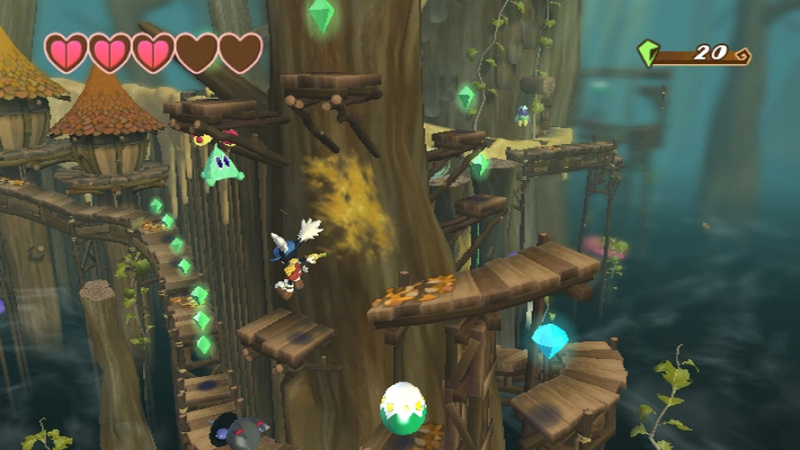 The various gameplay moves at Klonoa's disposal also add a lot of variety to the mix. Namco even chose to add in an interesting Wii motion control move that allows you to shake the Nunchuk controller in order to unleash a whirlwind that can temporarily stun certain enemies. It's a small addition, but it does come in quite handy for those times when you find yourself in a tight spot with one of the game's many enemies. Couple all of these gameplay moves with some absolutely amazing level design and you've got a game that plays as good as it looks. Being able to go back and collect villagers that you might have missed the first time around adds in a solid dose of replay value as well. The original Playstation version of Klonoa was certainly no slouch in the graphics department, but Namco has really raised the bar with this Wii update. The visuals in the game are absolutely stunning and the vibrant color schemes truly bring the world of Klonoa to life onscreen. Even the amount of detail found in the various backgrounds adds a lot of visual depth to the overall presentation. Namco has also tossed in some fancy cinemas that play out in between most levels, giving the game a more modern look and feel. The Wii console might not output true HD visuals, but you certainly wouldn't know it from playing this visually stunning title. While the visuals in Klonoa got a major upgrade, the music and sound effects weren't so fortunate. Of course that's not really a bad thing considering how fantastic the original soundtrack of the game was. You'll notice slight changes here and there, but for the most part it sounds pretty much just like the original Playstation release. Namco did add in some voiced dialogue to highlight the many cinemas that play out during the game, but the voices are a bit on the cheesy side and seem a bit overdone at times. It's certainly nothing overly annoying, but it will make you wonder why the same attention to detail taken with the visual upgrade wasn't given to this voiced dialogue. In the end, Namco has succeeded in resurrecting a game that truly deserved a second chance. What was one of the most overlooked platformers of the 32-bit era has now returned to glory on Nintendo's Wii console and feels as fresh today as it did ten years ago when it first debuted on the Playstation system. While platforming titles have certainly become more intricate and flashy over the years, Namco's update of their original Klonoa title proves that even a decade-old platformer can still hold its own when a developer puts the time and effort into it. If you're a platformer fan, you absolutely must own this wonderfully charming title. I will be buying it once I finish Klonoa 2. Looking forward to it! btw very good review Corbie. Kept this one on the radar, looks like it might be a purchase now (having heard much good things about the original PS1 game but not played it). i loved the original when it came out. I tried the sequel very recently but got bored, found it a bit childish and two dimensional, so might give this a miss on the assumption i might feel the same about playing the original again. I was always told how good this game was, but I never had the chance to buy it. Based on the review, I might give it a shot! And this isn't a full-price title in the US, isn't it? So I think I'll put it on my list next to DK:JB NPC. Nice review Corbie, this wasn't at all on my radar until now. You have totally convinced me. I am a sucker for 2.5D platformers, this sounds like just the ticket. Heads up for Euro readers, it's out on the 22nd May, only 14 days away. You can preorder for £17.99 at Play.com in the UK. A bargain price from the sounds of it! Yes! been hoping this would be good! @Objection_Blaster: Correct, it's only $30! I bought it Tuesday, and highly recommend it! Looks like this review is spot-on. I CAN'T WAIT TO GET THIS. It's not that expensive, and it's a bummin' good game, at that. No need for a review to tell me so - even though they do all seem to be saying that the game is excellent. Also, do you mean Tombi, Ian? I remember that game (or at least... the demo), and I was pretty impressed at the time, even though I never bought the full version. Now if someone would just listen to me and remake the first three Crash Bandicoot games for the Wii or DS, I'll be happy as larry. This game still does not look like much to me. this wasn't really on my radar, but the great reviews have convinced me to pick this up. New Play Control: Klonoa, Door to Phantomile! Great review Corbie! I bought this game and I love it! If you own a Wii you SHOULD own this game! Don't miss out on this excellent game! Do yourself a favor and go buy it right now!!! Yet another game on my to get list. I love a good platformer! This looks just delicious. Anybody have a napkin? I'm drooling all over the place here. Well I'm off to buy my copy. @MarkyVigoroth it's cant be a NPC because you can use the classic controller and gamecube controller, plus its a remake not a port. Have you beaten the game yet Corbie? Yep, and about 10 times on the PSone. REALLY want it. But I simply don't have the money. Got to save up for the new Punch-Out!! The english voice acting is Okay but i changed the language to Phantomile. If you aren't a fan of puzzles in adventure games, would you still enjoy this? I prefer platformers like Mario where it's all about timing with maybe a few secrets along the way. I'm also not a fan of backtracking unless it's an open world like Metroid. Is it a game that can be beaten in one sitting? Is it challenging or overly forgiving? I'm still not sure what to expect from this game. If it's not the kind of game that you can play over and over again, I'd rather wait and rent it. The puzzles aren't a huge factor in many of the levels, and even those that show up are more about timing and platforming than actual thinking. Yeah like some of the puzzles you have to hit all the switches in time and i gets challenging. Excellent. Thanks, I'll probably pick it up soon then. I bought it the other day thinking it would be could, but it was awesome! I love it. Don't know how I missed it before, but I'm glad I have it now. Any recommendations for other Klonoa games? I've played another one on GBA, but don't remember what it was called. Both GBA Klonoa games are fun, but much more puzzle-oriented in design. Klonoa 2 for Playstation 2 is great, although not quite as good as this original. Favorable review for a great game, but after the Kororinpa disaster I don't know if I can trust this reviewer's opinion anymore. You're right, Marble Saga: Kororinpa was a disaster. I heard this game was short. Is it true? The main story is kinda short, but after you beat the game you unlock reverse mode where all the levels are turned around, and getting all the villagers in each level is challenging too. Just added this to my must buy list. I love the Klonoa series, I've been dying to play the original Klonoa, but could never find it in my local trading shops, so this is going on my list! If this does decently, Namco might make a Klonoa 3 and release it on XBLA/PSN/Wiiware! I hope it sells enough to get the sequel put on Wii too. That's why everyone should go buy this wonderful game. I'd ♥ to see a Klonoa 3 someday. This game is very good. I'm also surprised with how beautiful it looks. The levels are vibrant and everything matches up so perfectly. No glitchy pixels, and almost everything looks in-line. Definitely 30 bucks well spent. Um, I guess I have to clarify because it wasn't clear enough the first time I said it. Your review of Kororinpa 2 was a disaster. Your criteria for reviewing games is pants. You clearly didn't play the game for very long because you failed to describe many of the game's additions and improvements. Instead you gave a non-passing score largely b/c it 'duzent play like teh furst won! !1' To quote user accc: "This review completely misses the mark... Once you unlock the customizable figure roller the controls barely feel any different than the original. it outclasses the original in almost every way." The comment about the faster marbles is quite accurate, once you spend some time with the game you get marbles that control as sensitively as the originals, the problem is Hudson attenuated some of the speedy stats for the first marbles in the game. Not to mention that most of the tracks after the first world or two are exponentially more challenging than the originals. I'm usually not one to cite capricious GAF, but you would be laughed off the message boards for this review. Maybe you should think of applying to Eurogamer, I hear a reviewer spot just opened up. No mention of the game's Challenge mode or other replay value-extending features. That surprised me the most. Otherwise, decent review. @taps: While I wasn't as critical, I wasn't a fan of the MSK interview either but each one to his own I guess... The game deserved better, if you ask me. I finally got it and I'm thoroughly enjoying it, been playing it a lot. I cannot believe Corbie just called the game a disaster when it's miles better than some other things I've seen. I'm gonna restrain myself from saying more about this... for now at least. I played the PS1 demo of this back in the day, and I thought it was pretty good. I was kidding calling the game a disaster. I was merely making a play on taps choice of words. At least WolfRamHeart caught it. I scored it a 6, which if you take a look at the scoring policy, you'll notice is "Not Bad" and that's exactly what I thought about the game. Our score of 6 is about what a 7 is on many other sites, and looking at MetaCritic, many of the media outlets scored the game in the 6-7 range. And as far as playing time goes, I actually put in quite a bit more time than I was originally alloted for that game, thus the review being a tad late, not to mention having to skip the Legacy of Ys DS review altogether. I consider the original Kororinpa one of the best Wii games out there, in fact it's in my Top 5. But this sequel changed things that did not need changing. And while I agree with the comment about the customizable roller, I felt like most people might not stick with the sluggish control long enough to reach that plateau. Just put in my order for Klonoa from Amazon. Now I can not wait. "Hideo Yoshizawa, the executive director/producer of the Klonoa series has stated the if the series was well received, he is willing to remake Klonoa 2: Lunatea's Veil for the Wii, and will likely make a Klonoa 3 afterwards, to develop the character." ^ I hear ya! I'm already buying a 2nd copy to give to my Nephew, and got a coworker to buy it too. Keep it up my Klonoa AV'd brotha! here is fingers crossed to another Klonoa. So far Klonoa has been jumping around from 24 to 27 in Amazons top hundred Wii games. I bought a second copy for my sister. She loved the original Klonoa on the Playstatioin so I couldn't resist getting one for her. I played the heck out of "Klonoa" for the Wii over the weekend and I have to agree with Corbie that it's a fun game! I love 2.5D platformers and hopefully we'll see a revival. Klonoa can be a shorter experience, but the item collection aspect of the game adds a little replay. The end of the game will definitely test your platformer skills. (Something that only the later levels of Super Mario Galaxy did...) Ok, NOW I'm asking for Tomba. I wonder how much "Icarian: Kindred Spirits (WiiWare)" will be like this? "If you're a platformer fan, you absolutely must own this wonderfully charming title." Really, I've been looking forward to this game for a while now, and it looks like it may very well be the first Wii game that I've bought in a long while. I've always been a huge fan of Klonoa, ever since I got it's sequel for Christmas. I loved this game. and I agree with your review and score. It might just be the cut-scenes or the way Klonoa flails in the air when he does his "hover." Also, the platforming is a bit tricky - I'm never quite sure if I'm actually going to land on a platform when I jump over a pit. The boss fights are kinda fun though I guess. I may or may not return to this game to complete it. I still think this is one of the best platformers ever. Such a shame we couldn't get a remake of Klonoa 2 and then a third one. This series really deserved better than it got. Klonoa is a very underrated franchise by Namco. It also helps that the series was created by Hideo Yoshizawa, the creative mind behind the NES Ninja Gaiden trilogy. Klonoa: Door to Phantomile combined charming 2D sprites with nifty 3D backgrounds for the time, an awesome soundtrack, and used a fictional language not unlike Panzer Dragoon. A shame it got lost in the shuffle among the crowd of 3D platformers of that era. 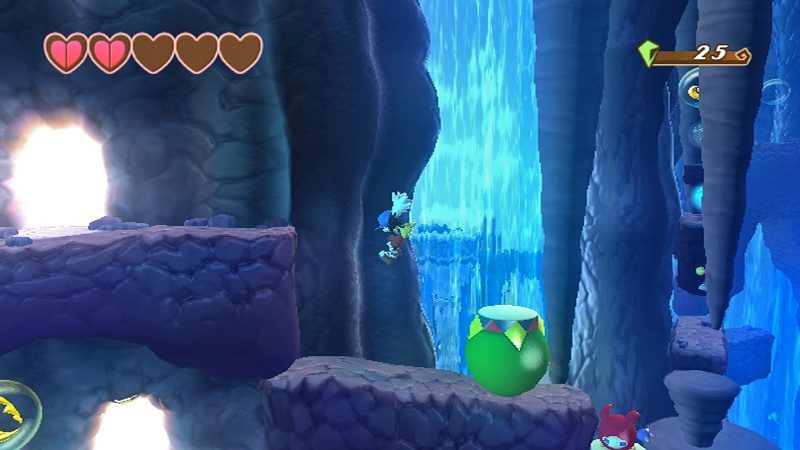 Fast forward a decade later, Klonoa: Door to Phantomile was gloriously remade for the Wii.